More than 9 million women have gone online for the first time in the last six months and this surge has led to gender parity in the Internet population. It has also reshaped America’s social landscape because women have used email to enrich their important relationships and enlarge their networks. The Internet has the opposite of an isolating effect on these users. They report that email has helped them improve their connections to relatives and friends. More than men, women say they are attached to email and pleased with how it helps them. Internet tools broaden users’ social worlds. In general, Internet users have more robust social lives than non-users and the most fervent Internet users are the ones who more frequently say email use has improved their bonds with relatives. Millions have used the Internet to rekindle relationships and locate long lost relatives and friends. They also report that they have learned more about their families on the Web. The use of email is changing how some families interact. It has increased communication in some relationships and perhaps been used as a substitute for conversation in others. Some family communications now revolve as much or more around email as they do on conversation. Email is not the Internet’s only “killer app.” Today, the number of Americans who seek information or complete transactions on the Web each day is the same as the number of those who communicate with email. 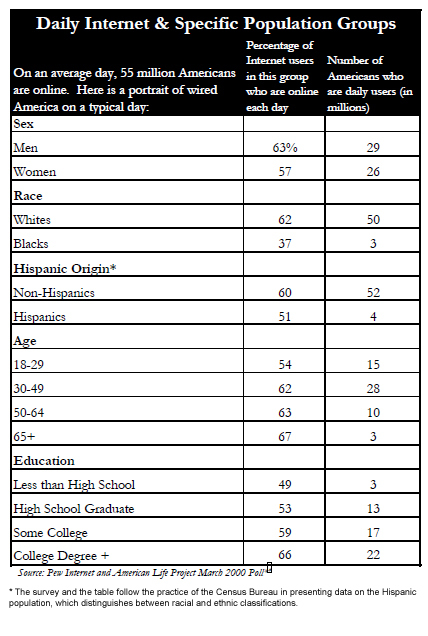 On a typical day online 55 million Americans log on to the Internet, 48 million Americans send or read email, and 48 million Americans perform at least one activity on the Web. On the Web, the gender gap is quite pronounced in some places. 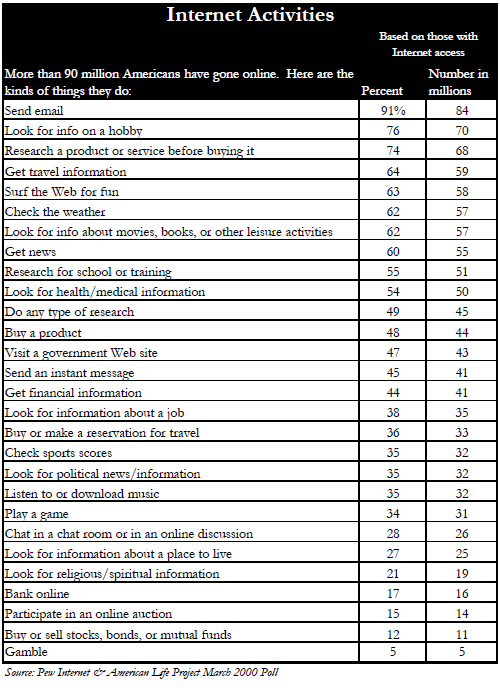 Women are more likely to seek health information, get religious information, research new jobs, and play games online. 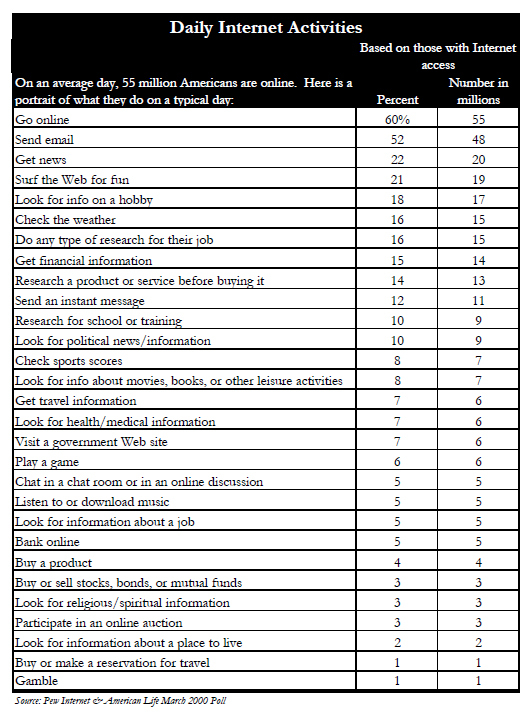 Men are more likely to use the Web to get news, shop, seek financial information and do online stock trading, participate in online auctions, access government Web sites, and search for sports news. At the same time, there are a striking number of online activities that are performed in equal measure by men and women. These often involve Web activities that are very popular with young adults. Many of these activities probably attracted young men and women to the Web in the first place. The Internet’s special communications methods like chat rooms and instant messages are used in equal proportion by men and women. Browsing the Web for fun is a leisure pursuit for twenty-somethings of both sexes. There is no gender-based difference in use of the Web when it comes to doing school-related research or job-related research. The Web is a popular tool among the young of both sexes for accessing popular culture by downloading music or getting information about movies, books and other leisure activities. And convenience activities online such as arranging travel and banking are also equally popular with men and women.